Searching for Bonobo in Congo » In the 1970s: Bushmeat Trade Manipulates Pygmy Economy and the Fate of the Forest. « Bushmeat 10: Did the Bridge Collapse Create a Bushmeat Boom for Mbuti Pygmies? In the 21st century the pygmy net-hunt has become a major source of bushmeat leaking out of the Okapi Reserve in Congo’s northeast Ituri Forest. 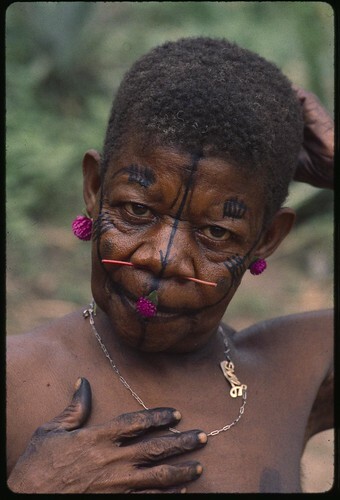 The Mbuti pygmies are ineluctably depleting the Reserve’s animal resources, their only resources, by hunting deeper and deeper into the forest. Outside traders pack their wares deep into forest hunting camps, to come out as quickly as possible with loads of antelope carcasses they will sell at a phenomenal mark-up to the expanding markets both in the village of Epulu and in distant towns. Is this new? Perhaps new in the Okapi Reserve, but John reported a similar commercialization of the net-hunt between 1973 and 1976 in the southern Ituri Forest. Fresh out of college, John spent two and a half years living with three different bands of Mbuti Pygmies. Later, 1979, he wrote up his observations as a Master’s Thesis. 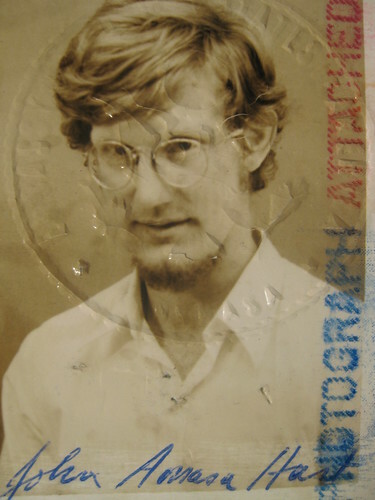 John’s passport picture, 1970s, from the period he studied Mbuti hunting economy in the southern Ituri Forest. Like many college undergraduates in the early ‘70s he was charmed by Colin Turnbull’s romantic anthropology “The Forest People” (Simon and Schuster, 1962). The image was appealing: the Mbuti pygmies living in material simplicity whose daily security was guaranteed by intimate familiarity with a generous forest home. What was glaringly absent from Turnbull’s depiction of Mbuti life was any biological or economic analysis. John was granted a Watson fellowship – 6,000 USD – to learn the economic-ecology of Mbuti culture in the Ituri Forest. He made the grant last two and a half years, covering his food, clothes and all his transportation. His largest purchase was a one-speed bicycle for occasional trips to larger towns. His second largest purchase was a kerosene lantern, so he could write notes late into the tropical darkness. John lived alone in the camps of three different Mbuti bands, each of which hunted different, but contiguous stretches of forest. He maintained continuous residence in the camps for periods of three to five weeks with only brief village breaks in between. His research tools were a tape recorder, a camera and hand-held spring-scales for weighing the fresh catch on net hunts and for weighing any garden food the Mbuti received in trade for bushmeat. John spoke Kingwana, a version of Swahili used throughout eastern Congo and used by Mbuti as well, although he also learned to understand the more localized languages of Kibira and Kipakombe. 1. Was it really possible for the forest to support an Mbuti culture living in isolation from agricultural villages ? This was Turnbull’s ideal. 2. How able was the forest to support the high bushmeat demand coming from towns in the east? Meat-traders were an emerging reality. At the Kugongea, or the opening fire at the start of the net-hunt where all the men, women and children gather who will take part in the hunt. Photo from John’s 1970s collection. John found a traditional interdependence between Mbuti and forest bantu. In the southeastern Ituri forest John found bantu populations for whom the forest is ancestral home. Among these groups, the Bira and Pakombe have been associated with pygmy populations for many generations, for as far back as their oral histories reach. There are family level relationships between individual Bantu farmers and individual Mbuti hunters. These bantu, known as bakbala (mkbala = singular), provide their Mbuti “partner” with agricultural starches (cassava, plantains, yams) from their gardens. Mbuti provide their bakbala with wild meat from the forest. The bakbala are also the source of tools and clothing for the Mbuti who, for their part, diversify forest products for the bakbala including mushrooms, fish, and honey. They also provide intermittent day labor for the village gardens. 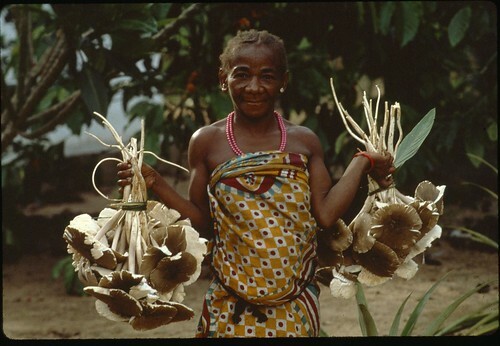 Mbuti woman with mushrooms she has brought to our house (1980s). 1/ Reciprocity is not necessarily immediate. John recorded periods where a mkbala provided his Mbuti with starch on many successive days with no meat in return. This was possible as the relationship was long-standing with confidence on both sides that each would support the other. The Mbuti would eventually provide forest products. The relationship was personal, and based not only on the needs of the other but also based on current availability. When there was meat, the mkbala would be recompensed. 2/ Relationship is one on one. A mkbala has a relationship with a particular Mbuti who then shares garden starch acquired with other members of his enlarged family and band. Likewise, a mkbala receives meat from “his” Mbuti which he will, in turn, share with his immediate relatives and neighbors. • Although there are Bantu ethnic groups living in the forest without relationships with Mbuti; there were no Mbuti living as forest hunters without bakbala relationships. The forest does not provide adequate starch. Wild yams and Mbau nuts are the biggest wild sources of starch, but yams are not abundant and have a very limited distribution whereas Mbau nuts are available only briefly with unpredictable seasonality. • Historically Mbuti have provided other services for bakbala. In the 19th and early 20th century they hunted elephants when the bakbala were being pressured by Arab merchants and later by Belgian colonists for this commodity. Even earlier the Mbuti were the guerilla warriors essential in the wars between different ethnic groups. From 1973 to 1975 meat traders became an increasingly prominent part of the Mbuti economy in the southeastern Ituri. These traders from distant towns packed full loads of merchandise directly into hunting camps where they replaced them as quickly as possible with full loads of smoked bushmeat they packed back to the markets. The merchandise they brought was most frequently rice or cassava flour, sometimes liquour, sometimes trinkets. 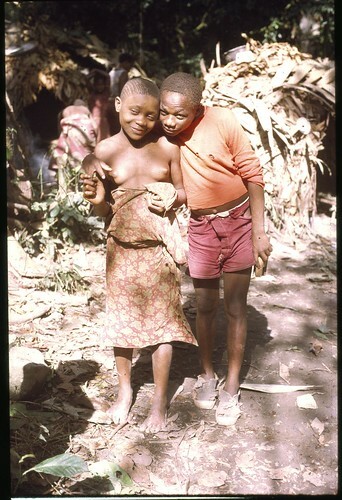 One of the three bands of pygmies traded almost exclusively with meat traders or bachuuzi. They also hunted the most distant forest. Woman wearing traditional Kange “paint”, flowers and twigs along with a trinket available from bachuuzi. 1/ The bachuuzi went to the most distant, animal rich camps. They traded exclusively for immediate return and left with their meat as soon as they ran out of trade items. Smoked meat begins to lose market value after a couple weeks so rapid trade was important. 2/Relationships with traders were ephemeral. There was no reciprocity, no willingness to make a loan. The bachuuzi’s goal was immediate profit and return on loans was far too uncertain to be practical. • Meat trade is exploitative. The value of the meat relative to the value of the starch decreased according to Bachuuzi trading standards. Several spot checks John made in the big markets around the forest showed that meat was running at five to ten times the amount paid by bachuuzi in the forest. The “prices” meat traders would pay for bushmeat were far inferior (1/3) to what the bakbala would give for the same amount. The Mbuti “allowed” this exploitation for the convenience of having the agricultural food brought directly to their hunting camp. • The commercial net hunt is depleting wild game resources. Over the study period there was decreasing hunting success and the Mbuti had to hunt longer hours and extend their hunting area into ever more remote forest, forest that would have previously been a refuge for animals. 1/ The Mbuti do not live independently in the Ituri Forest . Agricultural starch is an important and regular part of their diet. It is indeed unlikely that Mbuti live exclusively as hunter-gatherers anywhere in the Congo as we have since found that the Ituri was among the richer forests. 2/ Sustainable net-hunting cannot fulfill the bushmeat demands of surrounding towns. The Mbuti with commercial traders are continuously moving into more remote unhunted forest. Indeed the pattern in the southeastern forest of thirty-five years ago is very like the situation today in the Okapi Reserve. What would be interesting would be to know what has happened to the descendents of these three bands of Mbuti today. We will try to get this information and post it sometime during the next six months. Photo from John’s 1970s collection. This entry was written by Terese Hart, posted on 2009-12-30 at 5:24 am, filed under Bushmeat, Indigenous peoples, The Forest. Bookmark the permalink. Follow any comments here with the RSS feed for this post. Post a comment or leave a trackback: Trackback URL. Incredibly fascinating post. I wonder what the Bambuti / Babenzele et al were doing before the Bantu entered the forest and they developed this commensual relationship? Were they living around the forest edges, already pre-adapted for entering deeper in the forest once they struck up their relationship with the Bantus? Or were they ‘normal’ hunter-gatherers who only became forest experts after the arrival of the Bantu? Excellent question. We think that a hunting gathering life, particularly without iron, would indeed have been richer at the forest edges. Certainly forays deeper into the forest might have happened during the Gilbertiodendron (mbau) mast, but that tree also grows close to the forest border in many places. I’m inspired and we will put together a post on this subject soon. would turn most of the forest into this rich environment. The wetter parts ( cuvette centrale, west Cameroon, Liberia) are only home of farmers not of hunter gatherers. In the richer ecotone hunter gatherers probably could survive. good point. The last glacial maxima when the rain forest was significantly reduced was about 10,000 years ago — if I am not mistaken– with some periods even wetter than now after that. 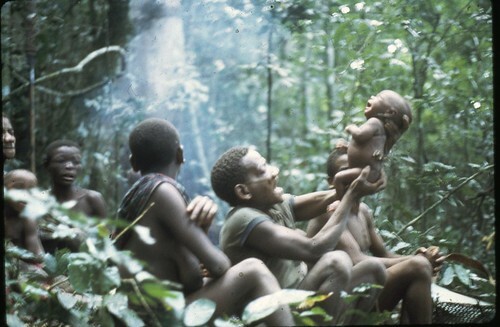 Certainly if as a group of people the pygmies go back thousands of years, they have seen some very different environments. And, as you say, it makes sense to us that they sought the richer ecotones and only came deep into the forest, in a permanent fashion, when associated with agriculture — even if they didn’t practice it. Great post mama. I really enjoyed reading it. I’d like to read Baba’s masters thesis as well. What Baba did for those two and a half years inspires me for this upcoming trip to Zanzibar! Hey sweet daughters… I’ve put your baba’s masters thesis under “other reports and publications” along with a couple other analyses written just yesterday when you were toddling about or not yet an idea. Interesting discussions on the role of the first inhabitants of the Congo Basin. I’m just back from the lower Likouala and Sangha Rivers in Congo-Brazzaville, where we found Bouvier’s red colobus, a species thought extinct by some conservationists. 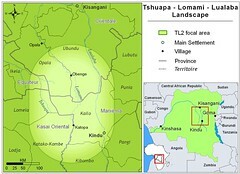 The Likouala area consists basically only of swamp forest and agriculture is virtually impossible. From what I understood there might be a similar trading system here between the people along the rivers catching fish and the people on more solid grounds producing agricultural products. Just think of the relatively large city of Mossaka and how few manioc fields are around. All starch products have to come from far. When in the field I often wonder how people in Central Africa lived 100, 500, 1000 or 5000 years ago. For example, don’t forget manioc, nowadays thé staple food, only arrived after 1492. And what changes would have brought the arrival of the first white people, forcing villages to be aligned along roads or rivers. Recently I got hold of the book ‘Paths in the rainforest’ (http://uwpress.wisc.edu/books/0644.htm). I hope this book will give more answers to my questions, but this post already cleared up part of them. Great story!